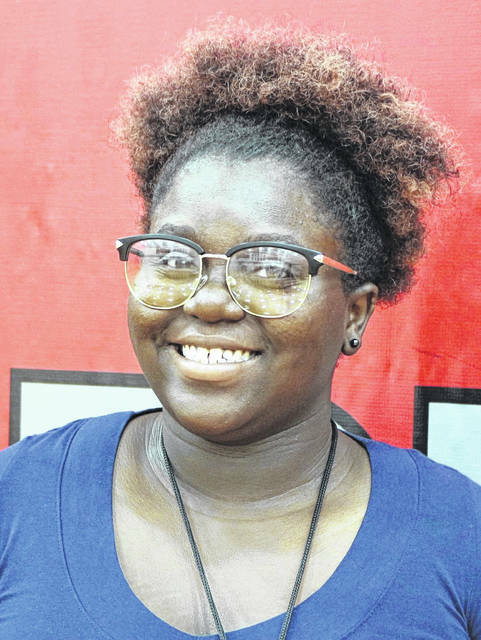 LIMA — Angeleta Cowan, 17, has some tough career choices to make as she enters her senior year at Lima Senior High School. “I know I want to go to college, but I don’t know what I want to go for. There’s so many things I could go for, like I could do,” said Cowan. Depending on her mood at the time, Cowan’s goals may change. “Sometime I’ll lean towards marriage and family therapy, or I’ll lean towards music. Right now I’m leaning towards cosmetology. If I do cosmetology, I want to own my own hair salon. So I’m in DECA, and that helps me with marketing stuff. If I want to do music, I’m in marching band, concert band, masterworks, show choir and Spartanaires. If I wanted to go to marriage and family therapy, there’s no classes I take here that might put me into it, but I know I give out good advice and I can help people change because my parents, they’re going through a divorce, and they come to me for advice and I give them advice to change how they are towards each other,” she said. It might take 12 years of classes to become a marriage and family therapist, but only a couple for cosmetology. “Out of those three, cosmetology is easier, but I don’t want to just go with the easiest thing. I want to choose the right thing that I want to stick with for the rest of my life,” she said. Cowan was inducted into the National Honor Society her junior year and is also a member of the swim team at Lima Senior. “Last year was my first year, and at first I didn’t think I was going to like it. I was going to quit. But I didn’t quit because it helped me grow more confident, and I also had a struggle with my weight, so it helped me lose weight as well,” she said. Cowan competes in the 50-meter freestyle. Cowan has found her experience at Lima Senior a mostly positive one and found a new appreciation for drama. “Things I do like about going to school here are mostly the teachers because they help you out a lot and you can learn a lot from those teachers. The drama club here, Mrs. Lee, she taught me a lot through just acting, and I didn’t think I was going to be all that good. The first part I auditioned for was ‘Beauty and the Beast,’ and I was totally scared of Mrs. Lee and I didn’t think I was going to make it, and then her voice was in my head because we had lost our Belle and her voice was in my head and said, ‘Just go for it,’ so I actually did it. I was actually Belle during the play,” she said.